An activity that makes you feel good, improves physical fitness and is available inside during the cold winter months? Sounds like something parents and kids would equally love. But rock climbing can be dangerous, and the thought of your child hanging 50 feet above the ground is, understandably, daunting. Nevertheless, rock climbing offers extensive benefits for kids. Besides releasing “happy” hormones called endorphins, which cause that feel-good feeling, it is a great aerobic exercise that burns more calories per hour than casual soccer or running. In addition, climbing develops muscular endurance and strength, flexibility, self-discipline, confidence, spatial awareness, problem solving, trust and communication. Probably the easiest and safest way to get started in rock climbing is to take your child to an indoor climbing facility. Originally designed for experienced climbers who needed somewhere to practice in the off-season, indoor climbing courses have morphed into a thriving industry where kids, and adults, can acquire climbing skills in a safe, controlled environment. Experienced instructors can gauge your child’s physical prowess, skill level and motivation for the sport. They will also teach the basic techniques necessary to ensure safety. Rock climbing is a vigorous and physically demanding activity. In addition to significant endurance, agility and flexibility, it requires strength in seldom-used muscles in the forearms, hands and fingers, legs, back and core. 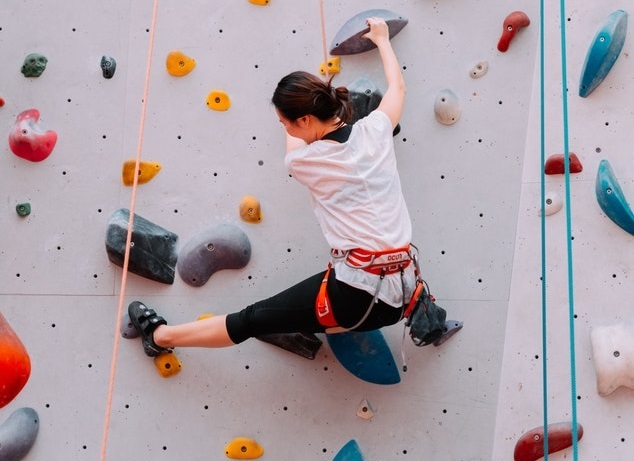 Before you or your child begins rock climbing, it’s a good idea to consult a physical therapist who can design a strengthening program that focuses on the skill set needed for rock climbing. In addition, they can create a series of warm-up exercises you should perform before climbing to avoid injury.